The Old Town is a lively quarter in the centre of Prague. Many of the city’s best shops, markets, restaurants and cafes are located in this area. Situated on the eastern edge of the Old Town, the Square of the Republic (Namesti Republiky) emerged at the crossroads of distant trade-routes during the founding of what was then the New Town of Prague. Its formation started in the 14th century with several important church and municipal properties. The Municipal House (Obecni dum) was built between 1906 and 1911 on the ruins of the old royal court. Renowned Czech artists worked on its Art Nouveau architecture, including Alfons Mucha, who designed the special plaque for the famous French actress Sarah Bernhardt. The front is decorated with the mosaic Hold Praze (Honour to Prague) by Karel Spilar. It was here that the independence of the Czechoslovak Republic was proclaimed after the fall of the Austro-Hungarian Empire in 1918. Today it serves as a restaurant, cafe and concert hall. Opposite, towers the house called U Hybernu (Hybernia=Ireland) with its Empire facade and Doric pillars. It dates from 1355, when the monastery and St. Ambrosius Church were there, founded by Charles IV in commemoration of his coronation in the church of the same name in Milan. The monastery was subsequently inhabited by a number of different orders and was renovated for the last time by Irish Franciscans in the mid-17th century. Legend has it that potatoes were cultivated in Bohemia for the first time in the gardens of this monastery. Closed in 1786 and later deconsecrated, it was at various times used as a storage facility, theatre and customs offices. Today the former church is used for exhibitions and is still named after its Irish former occupants. The Square of the Republic is without any doubt dominated by the most valuable tower in Central Europe. The Powder Tower (Prasna brana) was built as one of the gates between the Old and the New Town in 1475 on the site of an already very damaged gate as a coronation gift for King Vladislav II of Jagellon. Today its beautiful halls house temporary exhibitions. Presumably they were originally meant for court functions, since the tower was connected with the royal court next to it by a covered passageway above the street. Demolished earlier this century to be replaced by the Municipal House, the court was once the seat of several Czech rulers, who for one reason or another preferred it to Prague Castle. The Powder Tower gained its present name in the 18th century when it was used as a storage facility for gunpowder. This Gothic tower was restored in the 19th century by the architect Josef Mocker when the Neo-gothic roof and walkway were added. From the The Square of The Republic, take a walk along one of the oldest streets in Prague: Celetna. Two-thirds of the way down, you’ll come to the House at the Black Madonna. Built between 1911 and 1912, it is one of the best examples of Cubist architecture in the country. Behind it, to the south, is the site of the old fruit market with its recently restored cobblestones. Continue along Celetna and it will lead you into the Old Town Square. At the heart of the Old Town lies this immensely beautiful, mostly traffic-free, square surrounded by many Medieval and Baroque buildings. The centrepiece of the square is the monument to the preacher Jan Hus who was excommunicated and burnt in 1415 for his radical views on the Church. This Modern Art statue was created by Ladislav Saloun for the 500th anniversary of his death. On the eastern side of the square stands the pink and white rococo facade of the Goltz- Kinsky Palace which dates from 1755-1765. Behind it, the huge, ornate towers of Tyn Church dominate the Old Town Square. After St. Vitus’ Cathedral, this is the most remarkable religious building in Prague. Originally a hospital church, it was founded together with the hospital around the 10th century in the commercial Tyn Court. Merchants gathered here, bringing a large variety of goods often from very distant lands. In the 14th century, the hospital church was converted into the main cathedral of the Old Town. The Gothic building with three naves, bordered on two sides by houses, was not completed until the year 1511, when the southern tower was finished. This delay was caused by the Hussite Wars and an event at the end of them. On the orders of the detested Emperor Zigmund, the timber which was meant for the construction of the roof was instead used for a three-storey gallows. Fifty-two comrades of Jan Rohac z Dube, one of the last defeated “Taborist” leaders, were hanged here. The church is flanked on two sides by rows of houses. A passageway leads from a vaulted arcade to the impressive facade with a Gothic portal. Above the portal is a large window, decorated with artistic tracery. The facade pillars support a gallery which connects the two corner towers. A splendidly shaped triangular gable, decorated with a stone cross and a copper sculpture of the Virgin Mary, sits in between the towers. In one of the pillars of the Baroque interior is the tombstone of the Danish astronomer Tycho Brahe. He served as imperial mathematician to King Rudolf II from 1599 to 1601 when he died of an imploded bladder after over indulging at a feast. His remains are kept in the crypt. Linked to the church by a passageway, stands an early Gothic house (number 604/14) which used to be the Tyn school. Its cellar, like many others in Prague, contains the Romanesque foundations of a dwelling built when the level of the city was much lower than it is today. Nearby, set in a corner is the Stone Bell house (number 605/13). Built in the mid-thirteenth century, it is the oldest intact Gothic house in Prague and now serves as an exhibition and concert hall, having been restored in the 1970s. On the opposite side of the square at the corner of Paris Street stands the ornate Baroque church of St. Nicholas. Built by the Benedictines in 1735, it once saw acrobatics performed in its cupola. The Frenchman Jean-Pierre Blanchard, who swam the English Channel, gave demonstrations here in 1791. In the south-eastern corner of the square is The Old Town Hall (Staromestska radnice). From as early as the 12th century, the citizens of Prague’s Old Town aspired to the privilege which capital cities of other states already had: they wanted their own Town Hall. Surprisingly, despite being more interested in military strategy and the national arena than in local problems, the man who finally granted them this right in 1338 was the knightly King John of Luxembourg. The citizens immediately bought a house on a corner of Old Town Square and renovated it for the council and judge. However, the new city hall could not cope for long with the growing number of demands. Therefore separate city councils bought more houses over the following years. In this way a motley collection developed, but through a series of reconstructions, it gradually became more harmonious. Almost every century and every period of this or that expressive style added something to the structure and the decoration of the Old Town Hall. Six hundred years of Prague’s history have been written within its walls. Next to the Gothic window, complete with the Old Town coat of arms and the shield of the Czech Kingdom, is the beautiful portal which forms the entrance to the oldest part of the Town Hall. The Old Council Chamber has been preserved almost in its original condition dating from 1471. The wooden ceiling is held up by three Gothic joists, decorated with paintings and secured by gilded chains. In days gone by, these chains were used to close the Old Town Street. The Town Hall’s four-storey tower stands 69.5 metres high. It is bordered by a gallery, which used to be a passageway to the dwelling of the old housekeeper. On the south side is a one- level projection containing the sacristy of the Town Hall’s Gothic Chapel. The square looks peaceful today, but it has been the site of numerous bloodbaths. The most recent was May 8, 1945, a week after Hitler’s suicide when people in Paris and London were celebrating VE Day. Prague was actually the last European battlefield of WWII. Three days earlier, the city had risen against the Nazis and, in part of a battle that left 5000 Czechs dead, the Germans obliterated one wing of the Town Hall with a tank. It was two more days before units of the Russian Liberation Army liberated the town (US forces could have got there earlier, but stood idle so as not to breach the Yalta agreement). The blaze damaged the top of the tower, the clock, the Gothic oriel and part of the southern wing. The east and north sections were destroyed completely. Their facades had to be demolished. In memory of the destructive events of the war, some of the east wing was left standing. Fortunately, the historically valuable section on the south side was for the most part soon repaired. Outside on the east wall hangs a plaque, with the names of 27 leaders of the rebellion against the Habsburg family. The white crosses on the pavement indicate where they were decapitated and dissected on 21st June 1621. It is said that on the night of the anniversary, they return here to look for their missing parts. Also marked on the paving stones of the square is the bronze line of the meridian by which Prague calculated the time until its independence in 1918. Set in the high tower of the Old Town Hall, the golden disks of the Astronomical Clock date from 1410. Designed to show the movement of the sun and moon through the zodiac and indicate the months of the year, it was remodeled eighty years later by a man called Hanus who was blinded by the local council to protect their copyright on the design. An angry Hanus scaled the tower, sabotaged the clock and promptly died of a heart attack. It took another eighty years before it was set in motion again. Every hour, a crowd of tourists gathers to watch the statues of the 12 apostles appear in procession. Death, as represented by a skeleton, rings a bell, turns over an hour-glass and nods at a Turk. The Turk shakes his head, explaining he does not want to go with him. Greed weighs his purse in his hand and Vanity admires himself in a mirror while both nod contentedly. Take the side road leading away from the square and you will soon see the cream and brown facade of the House at the Minute. Around the next corner is the Small Square (Male namesti) whose main points of interest lie in the old pharmacy, the Renaissance grille of the fountain and the richly painted iron-monger’s shop of Mr. Rott. Continue towards the river and you will pass the Golden Well and the Golden Serpent on the narrow street called Karlova, before reaching the huge building called the Clementinum. In an attempt to form a great Catholic seat of learning, the Jesuits spent two centuries buying land and building this massive complex. Soon after it was completed in 1773, they were forced out of the country and the Clementinum was handed over to the University. The original Dominican monastery expanded into a monument covering 19 hectares, on the site where 32 residential houses had stood. St. Clement’s Church was rebuilt, schools and dormitories were constructed and the Italian Chapel was founded. A section with a theater hall and the Mirror Chapel with its library hall was added, together with the observatory and the church of the Holy Saviour. As well as containing the tower where Johannes Kepler made his astronomical observations, it also houses a meteorological station which has taken uninterrupted measurements since 1775. The Clementinum is a remarkable artistic monument, to which many great architects of late Renaissance and the Baroque period contributed. Within its walls are the original University Library, Music Library and National Library with 6 million items and a large collection of manuscripts and first editions some dating from 1370. In the grounds of the Clementinum is the Technical Library which contains valuable documentation about technical developments of the last two hundred years. Before you reach the bridge over the river, you come to the Knights Square (Krizovnicke nam.) named after the Order of the Knights of the Cross with the Red Star who were the original gatekeepers of the old Judith Bridge. Their single-domed church (dedicated to Saint Francis) stands on the river bank. Over the road is St. Saviour’s Church built by the Jesuits between 1578 and 1602. After the 19th century statue of Charles IV, comes the Old Town Bridge Tower. Designed by Peter Parler, it was the entrance gate to the Charles Bridge from the Old Town. This two-storey tower is richly embellished with architectural and heraldic decorations. A sculpture of the Emperor himself looks down from the central level of the facade, next to his son Wenceslas and in the middle St.Vitus under whose protection the bridge was given. Over the archway is a row of the carved emblems of the territories belonging to Charles’ Empire. Latin palindromes designed to entrap demons can be found on the roof of the second floor. In his diary, the philopher Arthur Schopenhauer wrote that over the river Vltava goes “a very beautiful bridge…, on which stand many religious sculptures, a wonderful piece of work”. The ancient Charles Bridge (Karluv most) is indeed an artistic piece of work. It is named after Charles IV (the Holy Roman Emperor and Czech King of Bohemia), who initiated its construction in 1357 to replace the originally Romanesque Judith bridge, which was battered by the onrush of the swollen river Vltava when it flooded in 1342. At 516 metres long and 9.5 metres wide, it was an imposing replacement. The emperor personally placed the corner stone and the young outstanding architect Peter Parler made a monumental Gothic building of it. At the beginning of the 15th century, Charles Bridge was decorated with sculptures. It gained its present appearance however in the Baroque period and became literally a gallery of sculptural art. For over four hundred years, the Charles Bridge was the only link between the two halves of Prague across the Vltava river which connects the city to Hamburg on the North Sea coast. Today it is the perfect place for feeding the seagulls, photographing the Castle, stocking up on arty souvenirs, taking in free entertainment from buskers, and getting your pocket picked if you’re not careful. As you cross the Charles Bridge from the Old Town, the green and wooded hump on the left is the Petrin district of the city. Its Look-out Tower is a sixty-metre-high copy of the Eiffel Tower built (two years after the original) in 1891 on the occasion of the Jubilee Exhibition. Today it is used as a TV transmitter. At the western end of the bridge stand two unequal towers connected by an archway. The smaller of the two dates from the 12th century and is a remnant of the Judith Bridge. The other, crowned by a spire, was erected in 15th century and is open to the public in the summer months. Leaving the bridge, you enter the Mala Strana (The Little Quarter or Lesser Side). On your left is Kampa, a small peaceful island well worth visiting for a look around its picturesque houses, exquisite square and park. Known as Prague’s Little Venice, it is cut off from the city’s left bank by a thin strip of water called the Devil’s Stream. The strip of land below Prague Castle, bordered on one side by Petrin hill and on the other by the river Vltava, has known human settlements since the dawn of the Czech civilisation. But it was not until the 13th century that people started to build fortified walls when Mala Strana was made into a city in 1257. A major programme of rebuilding was carried out in 1541 after the great fire. The town grew considerably under the reign of the Emperor Charles IV who decided to build a new wall around the city. Remnants of what is known as the Hunger Wall can be found on Petrin hill. It is a reminder of the famine of 1360-1361 when harvests were very poor. According to legend, Charles ordered the wall for humanitarian reasons: to provide people with employment and food. One of the oldest spots is the Maltese square, site of the Maltese monastery. It was here that the Knights of the Order of St. John set up a self-governing enclave in 1169. Today it is dominated by the rococo facade of the Palais Turba, now the Japanese Embassy, and the Baroque style of the Palais Nostitz (Dutch Embassy). Nearby is the Church of Our Lady of Victory. The first Baroque church to be built in Prague, it dates from 1611 and was rebuilt in 1644. Originally owned by German Lutherans, the church was later given to the Carmelites who were expelled and replaced by the Knights of Malta, who in turn were thrown out by the Communists. The church is famous for the Bambino di Praga, a foot-high Spanish wax effigy of the Infant Jesus gifted by Polyxena of Lobkovic at the end of 16th century. Internationally revered as a miracle-worker, it was once visited by a delegation from North Korea who brought a silk outfit to add to its scores of other costumes. Also close to the Maltese square is the former palace of the Grand Prior of the Knights of Malta which today contains the Museum of Musical Instruments. Next door to it stands the Church of the Virgin Mary Under the Chain (previously known as the Church of the Virgin Mary at the End of the Bridge) which boasts two huge gothic towers and a beautiful Baroque interior. Remains of the walls of its predecessor, a 12th century Romanesque basilica, can still be seen in the right-hand wall of the forecourt. Walking up Mostecka we come to St. Nicholas’ Church (Chram sv. Mikulase) in Malostranske nam. Dating from 1704-55, this is one of the most beautiful and historically significant Baroque buildings in Prague. Built by the Jesuits, it was fully restored in 1955 by the Communist regime. The 247-foot high dome is so huge that a commission of experts had to certify it was safe before anyone dared enter the building. The nave and vault are as staggering as the 1500-square-yard trompe l’oeil fresco depicting the life of Saint Nicholas (the original Santa Claus), whose feast day is celebrated on December 6th. The church is open in winter from 9am to 4pm. To the east of the square lies Wallenstein Palace and Gardens. In an attempt to rival Prague Castle, the ambitious General Wallenstein built his palace between 1624 and 1630. For this pretentious work, he chose the Italian architect Andrea Spezza, whose work was to be finished by other Italians. Baroque had come to Prague, even if some details, especially on the facade, indicate renaissance simplicity. As entrance there is a passage on the north side with simple steps. The main staircase is behind the first courtyard in the second section. Next to these stairs is a chapel with frescos. Wallenstein also had a hall built, which is two storeys high and is to be found south of the chapel. The walls of this hall are richly decorated with sculptural relief and the ceiling fresco of Baccio Bianco depicts Wallenstein as the god of war. East of this hall are the Knight hall and Wallenstein’s office. The so-called astronomical corridor, where there was once an observatory in the roof, the hallway to the private rooms and the rooms themselves are all beautifully decorated with wall and ceiling frescos. The gardens include a riding school with stables for hundred of horses, a grotto, an aviary, a cave containing a water reservoir believed to have once been a spa and a triple arched loggia known as the Sala Terrena. Its walls and arches are painted with scenes from Greek Mythology. The geometrically designed garden is also decorated with a fountain of Venus and copies of statues by the Dutch sculptor Adriaen de Vries. The originals were carted off by the Swedish Army during their occupation of Prague in 1648. Returning to St. Nicholas’ Church, we leave the square and travel up the hill along Neruda Street. Once the main road leading to the Castle, it is named after the 19th century Czech author Jan Neruda, who lived in the house At Two Suns. The street has more house signs than any other in Prague. Number 6 is the Red Eagle and Number 12 is the Three Little Fiddles. Other signs include a golden goblet (number 16), a golden key (number 27) and St Wenceslas on horseback (number 34). This trend for increasingly exotic names and signs came to a halt in 1770 when it was banned by the city fathers who insisted on the use of numbers. Number 33, Bretfeld Palace where Casanova and Mozart shared lodgings in 1791. Halfway up the hill, Neruda Street halts at a crossroads. Take the western branch towards the Strahov Monastery (not open on Mondays). The Premonstratensian Monastery of Strahov was founded in 1140 and soon became one of the great centres of learning in Bohemia, sitting as it does on the old trade route between Nuremburg and Krakow. The hill above the valley was for a long time overgrown with thick woods and home only to wild animals. In the 12th century monks built a wooden monastery in a clearing. Since there had to be an armed guard to protect the pilgrims and travellers, the place was named Strahov after the Czech word for guard (strahovat) The Bishop of Olomouc, Jindrich Zdik, founded an order of Premonstrats at Strahov, who fell under the jurisdiction of the French centre in Premontre. A major reconstruction of the monastery began in the Renaissance and Baroque period when buildings were added. The expensive reconstruction was hardly finished when Emperor Joseph II’s dissolution of the monasteries threatened Strahov. The Premonstrats only stayed thanks to the brainwave of abbot Mayer, member of the masonic lodge at the Three Crown Columns, to turn the place into a scholarly institution. Decorated with frescoes, the monastery’s two libraries in the Theological Hall (1671-79) and Philosophical Hall (1785-94) are the main reason for visitors to come to Strahov. They contain a collection of valuable globes, illuminated manuscripts and incunabula. The oldest manuscript is a summary of the Gospels and dates from the 10th century. An extremely valuable collection of first editions includes world famous printers like the Venetian Aldus Pius Manutius, Frobenius from Basle, Plantin from Antwerp, the publisher Elsevier and the renowned 18th century Italian typographer Bodoni. In the 1950s the monastery was expropriated by the Communists and three years later changed into the Museum of National Literature. The archives contained almost 6 million items in 1989, the Strahov library 900,000 volumes and the collections of expressive art 300,000 items. The monastery was returned to the Premonstrats in 1990 and with it all the collections which originally belonged to it. North of the monastery lies Loreto Square (Loretanske namesti) which is famous for two contrasting buildings: Cernin Palace and the Loreto. Two entire streets were demolished in order to make way for Cernin Palace, the largest palace in Prague. Five hundred feet long, its imposing facade of Palladian pillars and diamond-pointed decoration was created by Francesco Caratti in the 1670s and 1680s. During the Napoleonic Wars, the building was used as a military hospital. Later it was turned into a military barracks and today is houses the Ministry of Foreign Affairs. The builders of the palace excavated a mysterious pagan cemetery full of headless skeletons and hundreds of tons of earth. The fate of the bones is unknown, but the earth lay around the centre of the square for a couple of centuries until it was eventually patted down to form the embankment that can be seen today dividing the square into two levels. The original Loreto in Italy was one of Medieval Europe’s most popular shrines. It is said to be the house where Archangel Gabriel visited Mary and was flown over from Nazareth by a flock of angels to save it from marauding Turks in 1291. Following this miracle rescue, hundreds of imitations sprung up throughout the Continent. Fifty were built in Bohemia alone and the Prague Loreto was the grandest of them all. This copy of Mary’s house (the Santa Casa) was built between 1626 and 1631 and includes two beams and one brick from the original house in Loreto. Behind it stands the larger building of the Church of the Nativity which dates from the 1730s. At the sides of the main altar along with a copy of Raphael’s well known painting of the Nativity, are two smaller altars with relics of saints sealed in glass boxes. One belongs to St. Felicissimus, whose skeleton wears the dress of a Spanish noble and whose face is covered with a wax mask. The opposite altar is dedicated to St. Marcia, whose relics are covered by the gown of a Spanish of a court lady. Upstairs is the famous Loreto Treasure. The most valuable piece of all is the Prague Sun. A diamond monstrance, weighing over 26 lbs and standing three feet high, it was finished by Viennese jewellers in 1699 with gilded silver and 6,222 diamonds. The oldest item in the collection is the Gothic Grail of gilded silver, known to be of Czech origin. A perfectly modelled body of Christ is attached to a 17th century ivory cross. The panel-painting of Madonna with the Infant Jesus is the work of the Dutch painter Adriaan of Utrecht. The Redelmayer monstrance, also known as the Ring monstrance, is made of Arabic gold and the box in the shape of a heart for the consecrated wafers is enhanced with pearls. The coat on the sculpture of the Virgin Mary is made of red silk and embroidered with straw as if with gold. In the four-sided tower is a clock and a glockenspiel. The merchant Ebehard of Glauchov ordered the bells to be cast in Amsterdam in 1694 for the sum of 1500 pieces of gold. There are twenty-seven bells and each has its own patron. For the first bell it was Emperor Leopold I. The glockenspiel is played mechanically, but it also has a wooden keyboard. The Loreto is not open to the public on Mondays. On the northern side of Loreto square stands the 17th century Capuchin Monastery. From here it is not far to Novy Svet, the New World. Formerly a poor area of the city, it now draws many artists and intellectuals to its peaceful streets. Nearby is the Church of St. John Nepomuk, built in the 1720s. All these buildings are situated in the area known as Hradcany. In 1784 the five towns of Prague were joined to become a single city. Hradcany became one of the four town quarters. The square at its centre (Hradcanske nam. ), in whose woody centre stands the Plague Column sculpted in 1726, is home to no less than five palaces. On the south side stands the Schwarzenberg palace, decorated with endless Florentine sgraffito triangles and presently used as the Museum of Military History. To the east sit the Toscana Palace and Martinic Palace, whilst the northern side is occupied by the Archbishop’s Palace. At the side of it, a passageway leads to Sternberg palace, where the collections of the National Gallery of European Art are exhibited. The word Hradcany means those who live at the castle and on the east side of the square is the main entrance to the complex. Though separated from the city center by the river, Prague Castle makes its presence known as it looms over the city. The Castle is not so much a single structure as it is a hilly town unto itself – a town which developed between the 9th and 16th centuries with a variety of architecture. Beyond the breathtaking rooftop views of the city at the entrance to the castle complex are a number of attractions. Among them are St. Vitus’ Cathedral (which holds the crypts of Czech kings), the Basilica of St. George, the Old Royal Palace, St. George Monastery, Golden Lane, Daliborka Tower, Powder Tower, Lobkovic Palace and Belvedere Palace. Decorated with huge copies of the Battling Titans, the main gate leads you from Hradcanske namesti into the first of three courtyards. The changing of the guards ceremony takes place here every hour from 5 am to 11 pm. The first, so-called Ceremonial Courtyard, is the earliest part of the castle. Set into the Viennese Rococo style walls is the Matthias Gate. Through this archway, the oldest Baroque building within the complex, visitors pass the staircase leading to the Czech President’s office and then enter the second courtyard. Directly in front of the gate is the Chapel of the Holy Cross which houses the most valuable pieces of the cathedral treasury. In the middle is a Baroque fountain and disused well. 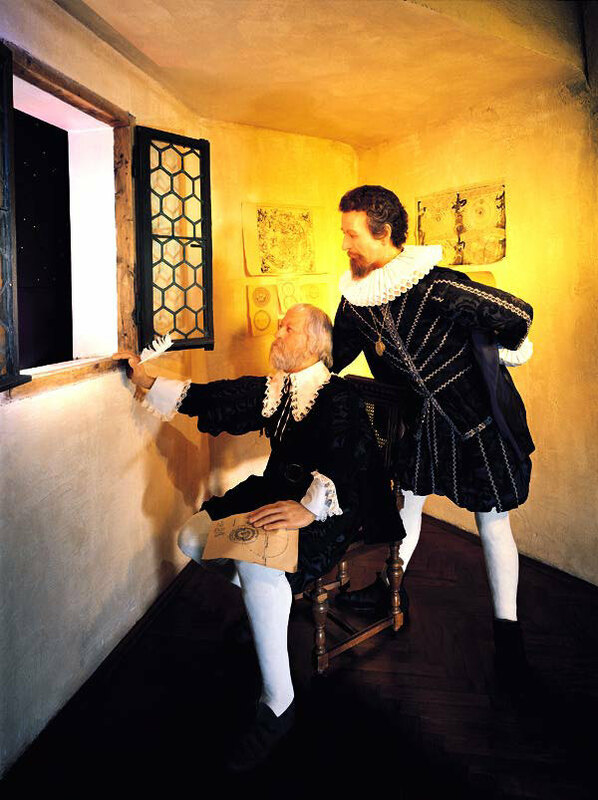 On the other side of the courtyard in the former imperial stables, art lovers can now gaze at the painings in the Castle Gallery, started by Rudolf II. The third courtyard is said to be the site of the original Slavonic fortress. Since the 14th century it has been dominated by St. Vitus Cathedral (Chram sv. Vita). Commissioned by Charles IV, construction of the cathedral began in 1344. The Frenchman Matthias of Arras began the work before Prague’s favourite architect, Peter Parler, took over. His sons continued with the cathedral until the Hussite wars interrupted the building. After many additions over the centuries, the final phase wasn’t initiated until 1873. The cathedral was finally completed in 1929. Although dedicated to St. Vitus, the cathedral’s main attraction is the Chapel of St. Wenceslas, built by Peter Parler on the site of the 10th century rotunda where the national saint was interred. Unlike the cathedral’s other twenty chapels, it was built with closed walls. Considered to be the most sacred place in the country, it is richly decorated with sculptures, frescoes and gemstones. Another much-visited chapel is that of St. John Nepomuk who was hurled into the river in 1383 for appointing an abbot against the wishes of Wenceslas IV. Three centuries later the Jesuits were looking for a Prague-based saint and invented the tale that the King had demanded John relate what the Queen had confessed to him, and that John went to his death rather than betray her confidence. In 1715 a canonization committee exhumed John’s body and found that his tongue was “throbbing with life” and still growing; he was canonized in 1729. The tongue was removed in the 1980s after further examination revealed that it was in fact a desiccated brain. Complete with supporting angels, his tomb is made from 3700 lbs of solid silver. Located between St. Wenceslas’ Chapel and St. John’s tomb is the Royal Oratory, connected to the Royal Palace by a covered bridge. It was built in 1493 for Bohemia’s one and only Polish ruler, Vladislav Jagiello. Nearby in the Wallenstein Chapel are the Gothic tombstones of the cathedral’s two architects. Also famous are the decorative sculptures up in the triforium. Twenty one busts depicting Charles IV and his family, various archbishops, Peter Parler and Matthias of Arras were placed in its lower gallery. Ten sculptures presenting Christ, the Virgin Mary and Czech patron saints are in the upper gallery. In the central aisle, just in front of the Neo-Gothic high altar, is the white marble Habsburg Mausoleum containing the remains of Ferdinand I together with his wife and son. Beneath them, Charles IV and Rudolf II can both be found in the royal crypt. The central tower, with its out-of-place Baroque top, stands almost 300 feet high. On the first floor is the largest of the cathedral’s four bells. Sigismund, cast in 1549, weighs in at 18 tons. To the right of the tower is the Golden Gate, once the main entrance to the cathedral. Admired by all visitors, its facade is covered with a mosaic of the Last Judgement. Formed by thousands of colorful glass cubes, it was pieced together in the 1370s. Many of the Bohemian Crown Jewels are kept in the permanently locked Coronation Chamber. Since it is not big enough for all of them, the most valuable were moved to the Chapel of the Holy Cross in the second courtyard. 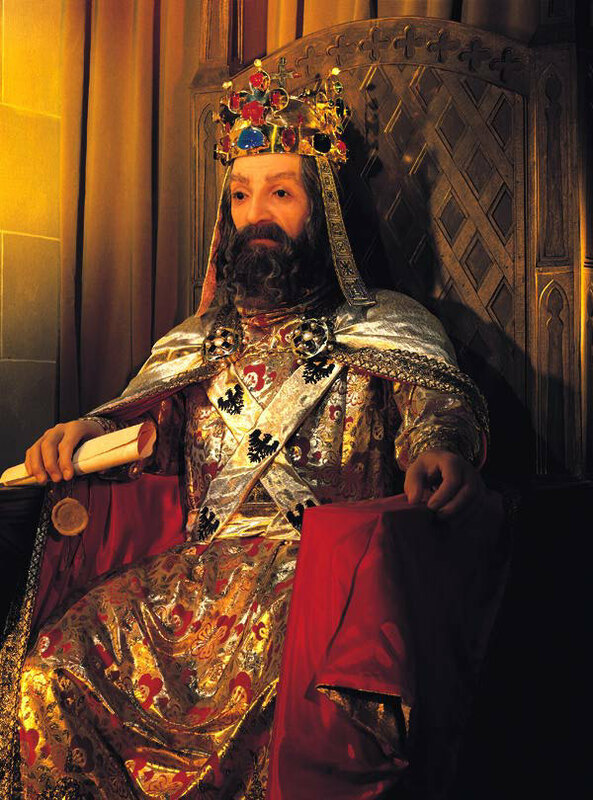 Charles IV dedicated the sapphire-studded crown to St. Wenceslas. Kings were only allowed to wear it at celebrations in Prague. Legend has it that whoever places the crown on his head without authority will die. When Czechoslovakia was occupied by the Germans during the Second World War, the Reichsprotektor Heydrich laughed at this “superstition”. He tried on the golden crown and even put it on the head of his son. Heydrich died following an assassination attempt by Czech agents parachuted in from England and both his sons were killed shortly after. The third courtyard also contains a statue of St. George fighting the dragon, a granite obelisk commemorating those who died in the First World War and the Old Royal Palace (Kralovsky palac) which was home to the princes and kings of Bohemia from the eleventh to the sixteenth century. Built up by successive generations, it houses a variety of attractions including the Gothic throne room of Vladislav Il, the Bohemian Council Chamber and Chancellery, the All Saints’ Chapel and the Riders’ Staircase. Further down the courtyard stands St. George’s Basilica (Basilika sv. Jiri), founded in 920, but rebuilt during the 10th and 12th centuries. Its charming red Baroque facade hides a beautiful Romanesque interior often used for classical concerts. A curiosity of the church, which never escapes the attention of any visitor, is the macabre sculpture of a skeleton, being crawled over by frogs, snakes and lizards. According to the story, an envious sculptor killed his lover and threw her in the brook of the Stag Moat. In jail before his execution he portrayed the unfortunate as she was found. It is nicknamed Brigit. Also worthy of attention is the Chapel of St. Ludmilla with its limestone tombstone and 13th century frescoes. Ludmilla, grandmother of Saint Wenceslas, became the first female Czech martyr and saint after she was killed by her jealous daughter in 921. When fire struck the basilica in 1142, legend has it that only the tomb of St. Ludmilla remained untouched. The German builder Wernher allegedly stole some of her relics and left the country. Every man who subsequently accepted the renovation work is said to have died and in the end Wernher himself passed away. Only when his son recognized this as a divine punishment and brought the relics back was the work finished. Adjoining the Basilica is St. George’s Convent, founded in 973 by Prince Boleslav and his sister Mlada for the Benedictines. Closed down by Joseph II in 1782 and put to use as a barracks, it was reconstructed in 1976 and opened as a part of the National Gallery to house the Old Bohemian Art Collection. At the far end of the final courtyard is Lobkovic Palace. Built in the mid-16th century, it is now part of the National Historical Museum whose displays include copies of the coronation jewels (the originals are kept in the cathedral). Opposite stands the house once occupied by the castle’s former burgrave (castellan), but currently containing the Museum of Toys. From here you can either take the Old Castle Steps down towards the Wallenstein Gardens or walk along the northern wall of the castle enclosure to visit its three towers. The Daliborka Tower was built in 1496 as a part of the castle fortifications and later used as a prison for the nobility. At its base starts the Golden Lane (Zlata ulicka), a row of tiny houses built into the castle ramparts during the 16th century. Historians are still arguing about the purpose of these little houses, even today. It is thought that they were constructed for 24 guards of Rudolf II, but it is also possible that craftsmen, salesmen and servants settled in this street later and built their own dwellings. Lost in the mist of time, the name of the lane would seem to derive either from Rudolf’s achemists or from the goldsmiths who lived here near the castle in the late 17th century. Whatever its origins, the street creates its own peculiar, separate little world, bizarre, mysterious and poetic. Kafka lived there for a while and it is now home to a number of craft and souvenir shops. At the other end of the Golden Lane stands the White Tower. Every alchemist who fell out of imperial favour, ended up in prison in here. Even so famous a master of alchemy as the Englishman Edward Kelly, initially rewarded by Rudolf II with wealth and a noble title, later got a taste of being locked up between these airtight dungeon walls. Further down the castle wall, behind the cathedral, stands the Powder Tower (Milhulka). This 20-yard-diameter tower was built as a foundry to make weapons, but was taken over by Emperor Rudolf as a laboratory for his alchemists’ attempts to transform lead into gold. Later it was used to store gunpowder and now houses a permanent exhibition about alchemy and metal casting. Outside the castle fortifications are the Royal Gardens. Although they are closed in winter, access can be gained to the surrounding area via the Powder Bridge (Prasny most) which leads from the castle’s second courtyard and passes over the wooded Stag Moat. The plain French Baroque building of the old Riding School has been converted into an art gallery (Jizdarna). Opposite is the Lion’s Court (Lvi dvur), built by Rudolf II to house his private zoo of big cats, bears and wolves, all in heated cages. Tycho de Brahe once cast the horoscope of the Emperor’s favourite, Muhammed the Lion, stating that the animal and king were bound by the same fate. Rudolf died the day after Muhammed. The building is now a restaurant. The Royal Gardens were founded by Ferdinand I in 1534. A real-tennis court (M¬covna) was added by Rudolf II on the south terrace. At the far end stands the Belvedere or Royal Summer Palace of Queen Anne. Now used for contemporary exhibitions, it was designed by an Italian architect in the 1530s.